Things have changed since Trump's election. Suddenly, he's no longer the worst human being in the world. Former enemies are now exhibiting deferential kindness toward their new president. Trump can be talked to and persuaded. He’s a reasonable man! He’s an innocent in politics and needs to surround himself with those familiar with how the globalist, er, American system works. 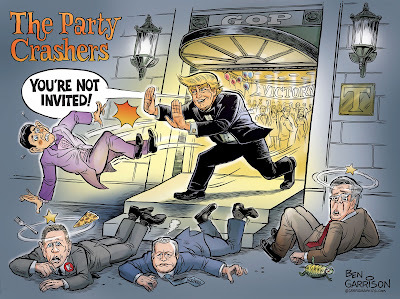 It's time to crash his party! That’s their new strategy. Ingratiation. Many of the ‘never Trumpers’ including Romney, Kasich and Bush have called to congratulate Trump after doing their best to destroy him before he was elected. Even the clown known as Glenn Beck wants to board the Trump Train. Will Trump be overwhelmed by the Beltway's ‘go along to get along’ status quo statism? Will he begin watering down his campaign promises? This is something many of his supporters now fear. The mainstream media are capitalizing on that fear and making claims that he won’t repeal Obamacare and that the wall might end up becoming a thin fence at best. They’re drumming up the narrative that Trump will compromise, thus making it a reality. People such as Paul Ryan are examples of politicians who compromise as a matter of routine—much to the disdain of many Republican voters. Trump is now also expected to compromise. Many in the alternative media have also hinted that it's to be expected. I disagree. He should not be drawn toward the slippery slope of compromise. The wall must be built. Obamacare must be revoked. Hillary must be locked up. Tariffs must be used to bring back industry to our country. America must become great again. Trump should gracefully accept congratulations from Republicans who formally smeared and ridiculed him, but he must not reward their betrayal by inviting them to have an influence on his administration. He should listen to world leaders such as Xi Jinping who has warned Trump about starting ’trade wars,’ but he must not compromise and bow to them as Obama has done. For too long trade agreements have been a one-way street that rewards other countries such as China while impoverishing America. 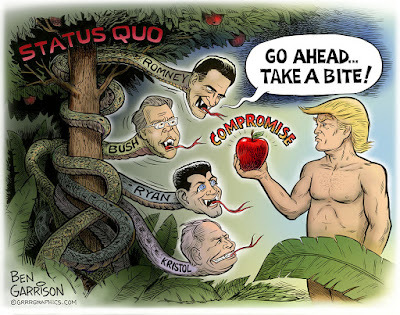 There should be no compromising when it comes to making America great again.